The NFL’s annual quarterback musical chairs game is taking a little longer than usual this year. Career-long rental QBs Ryan Fitzpatrick (free agent) and Brian Hoyer (made expendable in Houston) are there to be had. So are once beloved but now questioned athletic gems Robert Griffin and, for all intents and purposes, Colin Kaepernick. Yes, they have four-time Pro Bowler Tony Romo. But they also have a 35-year-old with recent back and collarbone troubles. Even if Romo stays healthy in 2016 and can lead the still-talented Cowboys back to at least the cusp of an NFC Championship appearance, Jerry Jones and the Cowboys brass will face the questions they’re facing now all over again in 2017. Which is why they should use the No. 4 pick on Wentz or Goff if possible. Yes, drafting a quarterback that high can be a difficult move for a team built to win now. But making such a move could mean you’re built to win for at least the next half-dozen years. (Ask the Packers.) And, it it’s not as if it compromises your competitiveness in 2016. They don’t like Nick Foles. 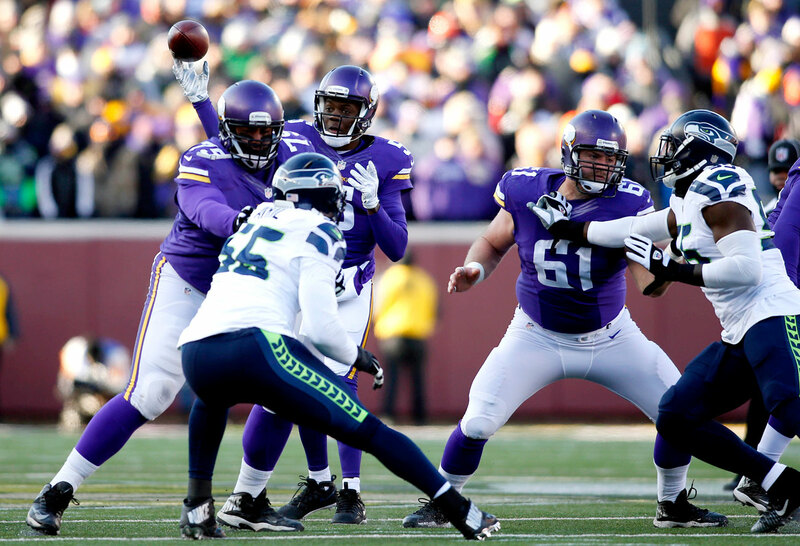 Case Keenum could not grab firm hold of the job last year. And we’ve heard almost nothing about 2015 third-round pick Sean Mannion. Eek. Making matters worse: The Rams don’t pick until 15 in the draft. On the bright side, this is one of the few offenses in football that’s built to proceed with a caretaker under center. The Rams’ M.O. is to feed star second-year back Todd Gurley behind a meaty O-line. Of course, part of the reason they play this way is things are as dire at wide receiver as they are under center. Los Angeles’s defense is not as dynamic as St. Louis’s defense was a year ago. The Rams will have to score more points in 2016. It might be worth taking a flyer on Hoyer just because in him you get an experienced signal-caller who, if the play design is agreeable, is willing to attack at the intermediate levels. Fitzpatrick is the same way except with a little too much of that willingness. That’s why, in a true ball controlling run-first offense, he’s not a great fit. • WHAT’S NEXT FOR KAEPERNICK AND RG3: Can the two once-promising QBs salvage their careers? What the Rams shouldn’t do is sign Robert Griffin in hopes of forming a read-option attack with Gurley. Griffin is too fragile for that, and his limitations as a passer are too deeply entrenched. (The Rams seem to agree; if they really wanted RG3, they would have gotten him by now.) If the Rams want to take a chance on a mobile quarterback, it’d make more sense to pursue Kaepernick. He too has drawbacks, but in a tightly managed, downfield play-action based attack (which interim-turned-fulltime offensive coordinator Rob Boras will likely run), he’s more salvageable than Griffin. Bay area native and Cal superstar Jared Goff can’t go anywhere these days without hearing about the 49ers and their No. 7 overall pick. That makes perfect sense. New head coach Chip Kelly’s scheme incorporates a lot of the spread principles that Goff learned in college. And, obviously, the Niners need a quarterback in the worst way. 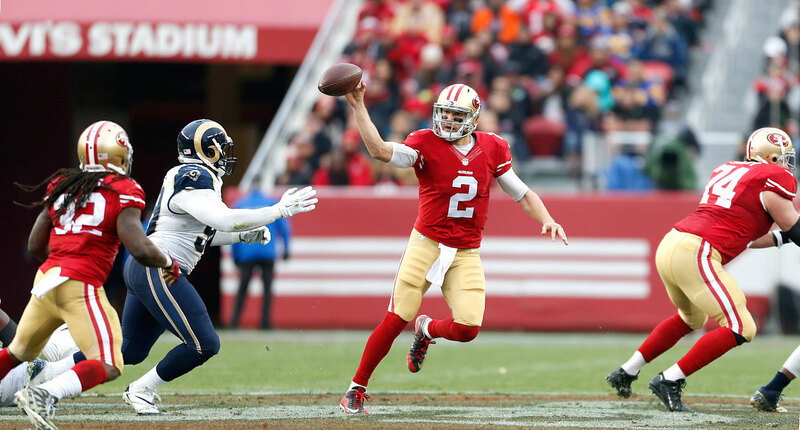 If they can’t bring aboard an outsider, Kelly will probably settle on Blaine Gabbert. He’s less mobile than Kaepernick but more inclined to play on time and from the pocket (where, granted, he’s inconsistent at best). Remember, Kelly tapped Nick Foles over Michael Vick in 2013. If the Niners can’t snag local boy Goff, Kelly could stick with Gabbert (2). It’s hard to believe Fitzpatrick has not re-signed with New York—the player and organization are reported to be miles apart on money—because Fitzpatrick is clearly the best remaining option for the spread-based, multi-receiver passing attack that coordinator Chan Gailey employs. That approach, with how it necessitates the ball getting out quickly, is the best way to naturally curtail Fitzpatrick’s bouts of recklessness. For the most part, Fitzpatrick, who played in the scheme under Gailey in Buffalo, was tamer in 2015. Unfortunately, he reverted to some of his bad habits in the crushing Week 17 loss to the Bills, which kept the 10-6 Jets out of the postseason. Maybe head coach Todd Bowles and GM Mike Maccagnan believe Fitzpatrick’s true colors showed. But if the Jets don’t re-sign him, what will they do? Griffin and Kaepernick don’t have the pre-snap awareness to identify a spread scheme’s quick-strike opportunities. Plugging in a chancy rookie doesn’t make sense given the playoff-ready talent on defense and the stability throughout the rest of the offense. At this point, if the Jets don’t re-sign Fitzpatrick and if they don’t trade for someone we don’t even realize is available, they’ll take a step back in 2016. Fitzpatrick really benefited from the Jets’ soft schedule—they only faced one top-10 defense (Houston), and he was poor in that game. He’s 2-24 in his career when his defense gives up more than 20 points, worst in the NFL by a lot. Johnny Manziel and his litany of problems are gone, but the consequences of the (frankly, stupid) decision to draft him in the first round are still being felt. After saying goodbye to all of their biggest free agents, the Browns, on paper, are worse now than when they went 3-13 a year ago. Which is why it might behoove Carson Wentz or Jared Goff to do what John Elway did to the Colts or what Eli Manning did to the Chargers—repudiate the team that drafted them. True, Elway and Manning did that as the draft’s first overall choice. Barring a trade up, Wentz or Goff would be doing it as the second choice. But so what? If you were a possible future franchise QB, wouldn’t you exercise whatever power necessary to avoid getting stuck on such a historically cursed and capricious franchise, one starting all over, yet again, from scratch? The Browns are going to draft a quarterback at No. 2. May God have mercy on that young player’s soul. The Vikings’ presence on this list seems ridiculous now because we’re talking about a third-year quarterback on a team that should have won a home wild-card game last season. But we’re also talking about a quarterback who does not attack the deep-intermediate levels through the air. In Norv Turner’s system, that’s a problem. Turner likes route concepts that stretch the field, particularly between the 20-yard-lines. In 2015 there were rumblings about the downside of Teddy Bridgewater’s ultra-conservativeness in 2015 (even beyond Mike Wallace’s grousing upon leaving Minnesota); expect those to become louder discussion points in 2016. Bridgewater led the Vikes to the playoffs in his second season, but he has yet to develop into a dangerous downfield passer. The last defending Super Bowl champion that made a quarterback change by choice was the 2001 Baltimore Ravens, who had one of the most dominant defenses of all time. The 2015 Broncos also had that, which is why the 2016 Broncos believe they can win it all again with a caretaker at the game’s most important position. So who is the safest quarterback to plug in? Mark Sanchez will certainly get a look. He hasn’t lasted as a starter because his pocket poise is mediocre and his arm is nothing special. But that’s not as big a deal in Gary Kubiak’s scheme, where zone-based play-action so often puts the passer on the move. The Broncos did not play this way much last season because Peyton Manning, like a roller chair on carpet, could move smoothly some of the time but not at all most of the time. With Sanchez, Kubiak could install more of his familiar moving pocket tactics—just as he did for the only mildly mobile, meekly armed Matt Schaub in Houston. Kubiak could also do this with Fitzpatrick or Hoyer. Some have speculated that the Broncos could be interested in doing it with Kaepernick. But you don’t need a mobile quarterback in order to have a move-oriented passing game. And you still want a QB with pocket fundamentals because at least half of your dropbacks will require that. 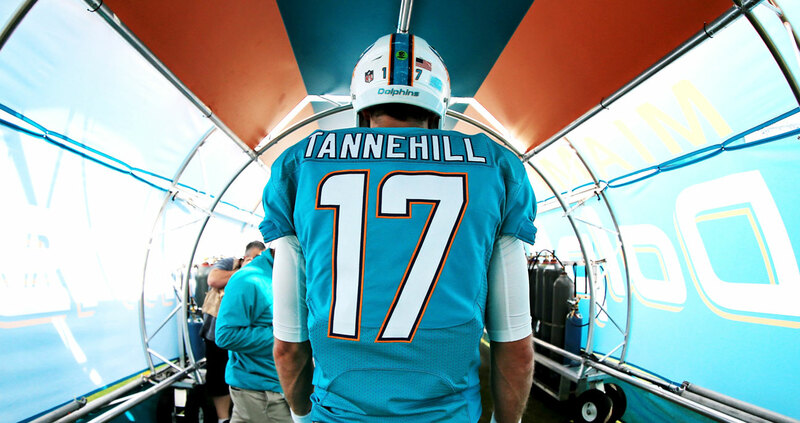 Some believe the Dolphins would like to move on from Ryan Tannehill right now if they could. More likely, they’re indeed treating 2016 as a trial year for the former first-round pick. New coach Adam Gase has worked around flawed quarterbacks before (see Tebow, Tim) and, more recently, he’s turned around a talented one (Jay Cutler). Gase favors a quicker dropback passing game and unbalanced formations—both tactics that simplify things for a QB. Tannehill has okay tools to build on; he moves pretty well, the arm strength is there and, though not nearly often enough, so is the accuracy. Gase’s arrival is the best thing that could have happened to Tannehill. That said, if the Dolphins are a game or two below .500 after Halloween and the offense has been up and down, Tannehill’s thin ice could start to crack. Tannehill could benefit from Adam Gase’s tutelage. The Bills were pleased with Tyrod Taylor’s debut season as a starter. Taylor calmly oversaw the league’s top-ranked rushing offense and kept his mistakes to a minimum. A few concerns remain, however. The 26-year-old is slight of frame, which is unsettling for a QB who has Taylor’s mobility and courage. Also, he’s a “see it” passer. That is to say, Taylor must see a receiver break open before he pulls the trigger. He is not an anticipator. That’s not the worst thing, but you need to compensate with arm strength. Taylor throws a nice deep ball, but arm strength is measured by a ball’s velocity, not its distance. Strong-armed throwers fit balls through tight windows. Taylor does not move the meter a great deal here. If he struggles in Year Two, the Bills will be in the market for a signal-caller next year. As John Madden likes to say: If you have two quarterbacks, you have none. Newly signed free agent Chase Daniel is 29. The last time a career-long backup QB blossomed into a quality first-time starter at that age? Rich Gannon for the Raiders in the early 2000s. Before that, Steve Young for the Niners in the mid-’90s (and that was a very unique circumstance). Maybe Sam Bradford (recently inked to a two-year extension at $18 million per year) will be better in 2016 and keep Daniel on the bench. It will depend on how disciplined Bradford can be operating in a well-designed offense that’s full of defined reads. Nevertheless, we’re talking about ifs and maybes here. So what should the Eagles do? Stay on the course they’ve chosen and hope for the best. The best will be one of two extremes: either a surprisingly impressive showing by one of their guys, or a team-wide face-plant that can be chalked up as a post-Chip rebuilding year. That would leave the Eagles drafting near the top in 2017.